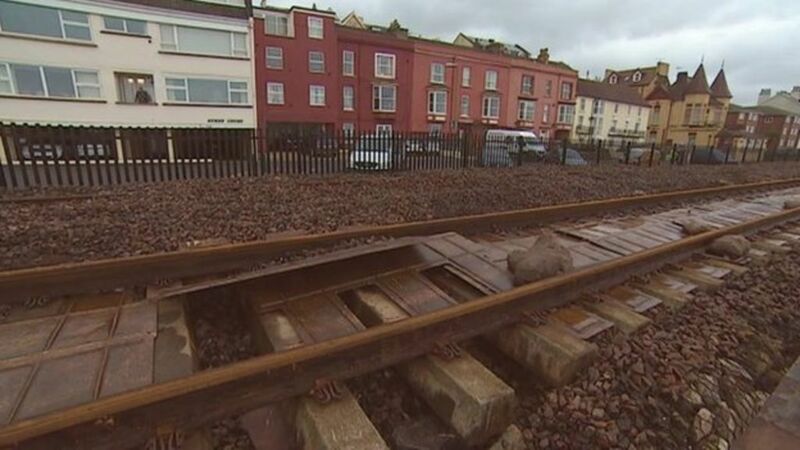 Repairs on a section of storm-damaged coastal railway line in Devon have been halted because of safety concerns. Network Rail said it was pulling all repair staff away from working on the section of track at Dawlish. The infrastructure owner said up to 50m (165ft) of track was unsafe after supporting ballast was washed away this week, but it was stopping work because fresh storms were due to hit the coast. It said it hoped trains would run again by Friday at the earliest. Repairs on a section of coastal railway line in Devon, which had supporting ballast washed away, are halted over safety concerns.